The CHIREC Ophthalmology Centre has a team of 41 highly skilled surgeons experienced in all the aspects of medical and surgical ophthalmology. Since 1979, our innovative team has been involved in cataract surgery and intraocular lens implantation and performs over 5,500 operations every year. 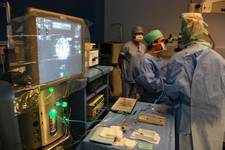 We are a key centre for surgical ophthalmology treatment in Belgium and the leading unit in Brussels. The Centre has five phacoemulsificators, YAG and Argon lasers, a fluoroangiography unit, a Pentacam, OCT (Zeiss) equipment, biometry and echography-B technology, a computer campimeter and a laser-interferometry system for intraocular lenses calculation as well as a range of other modern devices and equipment. The Ophthalmology Centre provides consultations and treatment for most eye diseases, focusing specifically on cataract and vitreo-retinal surgery. CHIREC has four sites, the two main ones for ophthalmology being the Parc Leopold Clinic and the Edith Cavell Clinic. M. Reiter, MD, Head of the Ophthalmology Department. Dr Reiter was one of Belgium's pioneers in implanting intraocular lenses and using phako-exeresis and has used these techniques since 1977 at the Brussels Surgical Institute and since 1979 at the Parc Leopold Clinic. excimer and lasik surgery since 1998. He also performs surgery to correct glaucoma, strabismus and ptosis.